At a certain point in life, you’ll start to see many of your peers become homeowners. They’ve graduated from living with their parents or living in a small apartment and now have spaces of their own to call home. While you might be tempted to join them right away, there are several reasons why doing so without a plan could be very risky. If you have a romantic notion of home ownership, it’s important to understand the reality. And that reality is owning your own home is expensive. Even if you find a good real estate deal or think you can save money by purchasing a short sale or foreclosure, homes cost a significant amount of money just to live in and maintain. Major expenses don’t begin and end with a down payment and closing costs. ● A down payment that covers 20 percent or more of the purchase price of the home (this lessens the amount you need to borrow and also helps you avoid private mortgage insurance). if you’re thinking about buying that gorgeous $315,000 home down the block, you’ll need to be prepared to pony up $63,000. And that’s not even including closing costs! ● An emergency fund. This should be three to six months’ worth of expenses, saved up in cash. This fund should cover you in case of an unforeseen financial emergency. If you’re looking to buy a home, you may want an even bigger emergency fund — because homes come with even larger unexpected financial costs. ● Other financial goals in progress. This means you need to have your consumer debt under control (or completely eliminated) and contributions established for your retirement accounts. You should not sacrifice your future (or current!) financial stability to buy a home today. That’s a lot of cash to have allocated to different savings goals. It may be tempting to move your retirement accounts around so you’ll have money for a big enough down payment. Or to pull everything out of your emergency fund in order to be able to afford a new home. But this is asking for trouble — and these four reasons to avoid cleaning out your savings to buy a house should explain why. Let’s imagine for a moment that you did empty your savings to buy a house with whatever cash you had on hand. Congratulations, you’re a homeowner! Then a few weeks after you’ve gotten those golden keys, your car breaks down and you have to purchase a new one. Or your spouse ends up in the hospital. Or you lose your job. You have no means to pay for the medical bills. You can’t afford to get your car repaired, much less replaced. And how are you going to look for another job without a car? Yes, these are worst-case scenarios, but they do happen. It is never a good idea to leave yourself so vulnerable, even in the name of buying a house. With all your money tied into your home, and next to no equity to borrow against, you won’t have access to any liquid funds. What could have been a small financial setback can turn into a financial nightmare that takes years to bounce back from. Maybe you decide that instead of buying the really nice $315,000 home, that you should really look into buying a fixer-upper. It’s cheaper, and you’ll get to put your own mark on the house. But where is the renovation money going to come from? If you spent all your money on a down payment, you probably don’t have enough cash flow to finance a $40,000 renovation. That’s probably only going to get you a new kitchen and maybe some flooring. You might be tempted to say “Put it on the credit card!” That’s definitely not the right answer. You’ll be stuck paying for the renovation for years to come – on top of any interest that accrues. What if the debt becomes so unbearable, you can’t afford to pay your mortgage anymore? You’ll be at risk of foreclosure on the very thing you sacrificed your savings to afford. Wouldn’t it just be nice if you were able to pay for the renovation at least partially in cash? That could very well be a possibility if you decide to start a savings account solely dedicated to saving for your future home. You could start your new life as a homeowner without any financial worries. Becoming a homeowner also means a whole new slew of responsibilities. If you’ve rented in the past, you might be used to calling maintenance if the slightest thing went wrong. Now, it’s on your shoulders to fix any issues that may arise within your home. So if any appliances die, your roof starts to leak, or you need to limb up surrounding trees every other year, it’s going to come at your cost. That’s why you need to keep savings funds in tact before buying a home–there are regular, recurring expenses to deal with far beyond the down payment and closing costs that allowed you to get in the home. The mortgage experts at Total Mortgage will close your loan in 30 days or less, guaranteed! If you don’t buy a house, you could invest your money in the market instead. If you could earn more over time in the market if you cash was freed up for investments, but you choose to tie your money up in a home, this is an opportunity cost. What you choose to do here comes personal preference and your current financial situation. Would it be smarter for you to put your money to work and invest it? Or would you rather use it to buy a home? You need to determine what your future goals are and the best way to reach them. Another opportunity cost can come in the form of debt repayment. If you have debt, consider whether it’s best to pay off your debt first, or start saving for a down payment. This will largely depend on the interest rates of your current debt. Ask yourself how long you plan to live in the house. If you think you might move to another area in less than five years, you should probably hold off on buying. 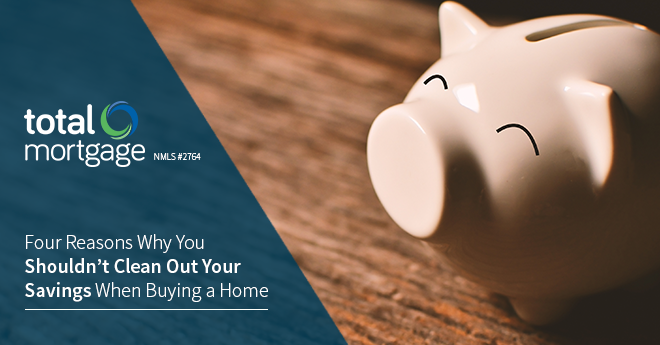 Homes typically won’t appreciate in value that fast for you to come out ahead when you go to sell, and it’s extremely difficult to recoup your expenses (like closing costs and regular maintenance) if you sell within five years of buying. Don’t forget, there are taxes to consider if you’re not interested in settling down for a long period of time. If you wipe out your savings to buy a home and then decide you want to sell before you’ve owned the property for more than two years, you’ll also have to pay capital gains tax on any profit you make from the sale. You’re exempt from this 15 percent tax obligation if you’ve owned the property for more than two years. It’s also important to take into account whether owning a home at this point is truly right for you, regardless of how long you plan on living there. Renting could be cheaper. Try plugging your numbers into this rent versus buy calculator to get a better picture of which is less expensive. Instant gratification isn’t going to get you anywhere in the world of homeownership. You’re much better off, financially and otherwise, spending a few years saving up for the purchase. It will all pay off in the end – literally. Even if you have some savings right now, ask yourself if it’s truly enough to afford your ideal home. You need to set a budget for what you can afford, be realistic, and stick to it! Don’t go into homeownership with blinders on. Are you looking to purchase a new home? Rates are close to the lows of the year, and you may be able to lock in a low rate for many years to come. Call us today to get a free rate quote or to speak with one of our licensed mortgage professionals. Some good points raised by Andrew. Last year we have bought our new home and it cost me a little bit less then of my expected budget and for that I would like to thanks http://agentace.com/ as they provide experienced and knowledgeable agents and also charge a very nominal commission. The agents was quite expert and helped me to get my dream home within my preferred budget and locality.